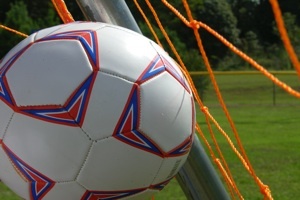 Football is an extremely popular sport in Belize, and after San Pedro was host to a football tournament, Sagebrush Community Church has continued to highlight sport with a family football camp. Â On Saturday, October 12th the community continued with their ÂKnow Christ and Make Christ KnownÂ vision to bring excitement and fun to those living in San Pedro Town. Last week, a team of community workers, including soccer pros Kristen Gracysk and David Baca, in addition to a team from SagebrushÂs main campus church in Albuquerque, New Mexico, USA, held a football camp for youngsters. Â Located north of the bridge in San Pedro, every child was given a pump to blow up their soccer ball for the event. Â They were also able to take the ball home after the camp so they can continue to practice their ball skills. Â In addition, the Sagebrush community brought food to the event, providing those in attendance with a healthy lunch of chicken burritos for both parents and children whoÂd come along to participate. Talking of the event, Sagebrush Community ChurchÂs Missions Director, Meredith Nohviay Melton said that they wanted to build a strong relationship in the community so people know they can rely on the group for support and aid. Â In addition, they strive to use their service to provide a message of love, mercy and grace. Â In addition to the football camp event, Sagebrush holds the ÂKids PlanetÂ program; a free weekly Sunday childrenÂs event. Â Like Sunday School, Kids Planet offers a place for youngsters to come and play games, explore the bible, learn about Jesus and experience live praise and worship. At the football camp, Sagebrush Community Church took the opportunity to announce that the church was going to start a new series named the ÂGreatest story ever told.ÂÂ The six-week event is to span the entire bible, starting from Genesis and working through to Revelations. Â The series will be showcased each Sunday at the Paradise Theater. For those taking part in the football camp, it was a great day all round, with children able to get some good tips on how to play the popular game of soccer. Â Sagebrush showed continued support for the community in and around San Pedro Town, and hoped that in the future individuals will join them for prayers and services.